This will be my last entry for awhile from the state of Colorado. This evening I will be boarding an Amtrak train to take me from Denver to Chicago, and tomorrow I'll board a train from Chicago to Boston. By Thursday evening I'll be on the east coast and with any luck the baggage gorillas won't have broken my bicycle. My friend Cindy from the Roseville days will be picking me up in Boston and we will spend a few days hanging out there before heading south to get me to Yorktown. Assuming that everything goes as planned over the next few days, the morning of April 30th will be the beginning of my big ride. One of the last things I did before moving out of my old place was to weigh my bike and bags, and my complete load before adding food and water is sitting right at 100 pounds. Put simply I'm carrying too much stuff. I already have some ideas about what I want to ditch, but I think I'm just going to go ahead and get started with what I have and figure out what I don't need as I ride. This weekend I took my very first ride with a completely loaded bike. It wasn't as bad as I thought it would be, but then again I wasn't trying to get the bike over any steep grades. I was surprised at how differently the bike handled when it is loaded down, it felt a lot like the difference between a sports car and a motor home. The bike just has a lot more momentum pushing it, and changes happen much more slowly. Once you are moving the bike wants to keep moving, and once you start turning the bike wants to keep turning. So I set out on my heavy bike for a practice ride without any real destination in mind, and was originally only planning on riding for 30 minutes or so. Somewhere along the way my subconscious autopilot took over and before I knew it I found myself heading down the road to Ault again. I made the 20-mile ride to Ault without any problems and was surprised at how silently my bike rolled along the road, even with all the weight that was loaded onto it. A day without problems would be like a picnic without ants, and my problems started on the way back. Once again I had made the mistake of setting out for the day without "eating" anything more than four cups of coffee. 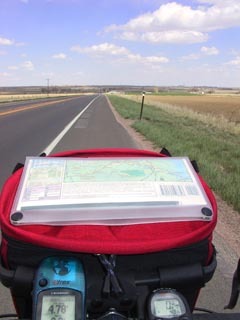 Halfway between Ault and Fort Collins, as I was struggling against a 15 mph headwind, I just ran completely out of gas. I made it to the edge of town, but ended up calling Joe to catch a ride back to town. A little dissappointing to me, since I know that I won't have anybody to call on the big ride, but not too much of a letdown. After all, I hadn't set out to go very far, and I could have dealt with everything else just by taking a break and eating a snack. good luck on your trip. looking forward to reading your updates. i am going to do the transam next year, pretty much like you...quit my job and just do it so your trip will be like a warm-up for me. oh, don't forget to eat something next time! I'll come pick you up if you get tired. If only you would let me take care of your 4-Runner while your away. Good luck. Logon to IM when you can.